Photographed at the Miami Zoo. They had a tall platform that a person could feed leaves to these giraffes on, so the were litterly eye level to you. What a fun experiance. I really like the overall composition, detail of the giraffe, the lighting, and depth of field used. Well done. Thank you Talsi, I always appreciate the compliments!!!! 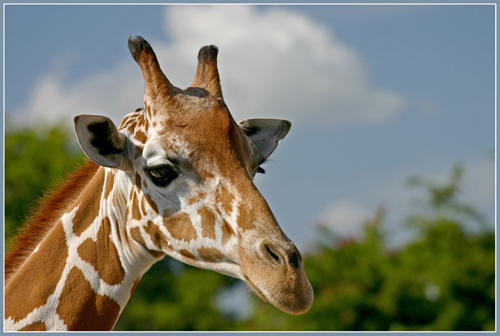 Terrific portrait of the giraffe.